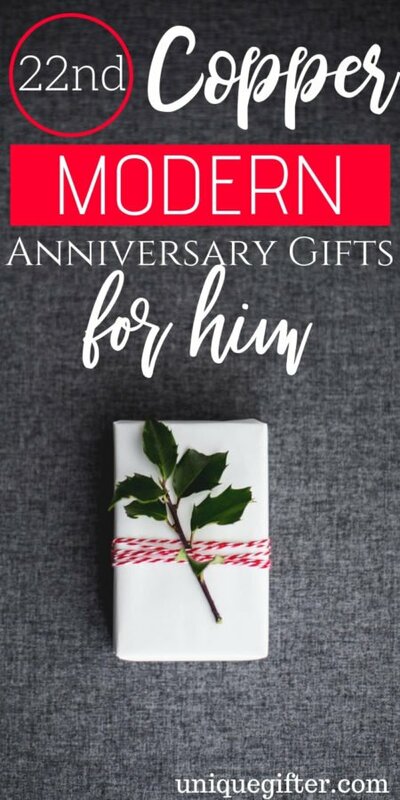 Modern anniversary gifts seem to be more practical than the traditional gifts, but both are very symbolic. 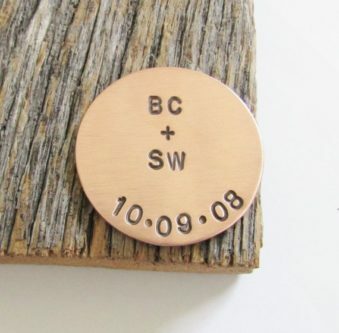 For you and your husband’s 22nd copper modern anniversary, there are so many gifts to choose from for him. Copper is popular, and also seems pretty masculine as well. Check out these ideas. 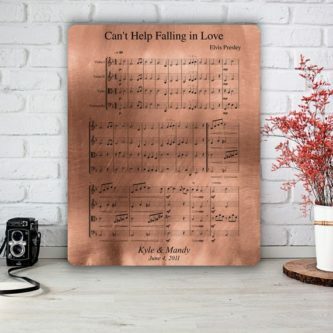 Put your song as a couple on this piece of copper sheet music, and make his day. 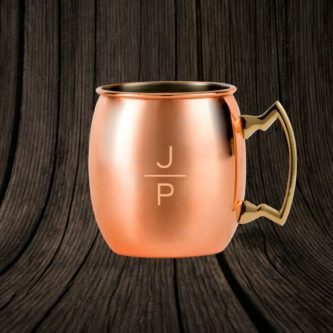 He can use the personalized copper moscow mule mug on camping and hunting trips, or right at home. 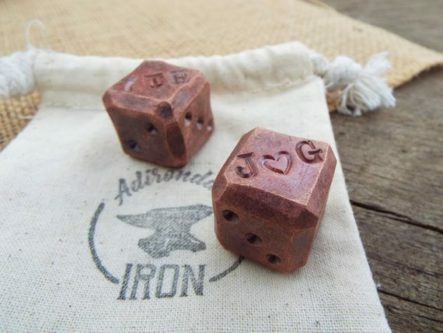 Great for decor for his desk at work or home, the forged copper dice have an option for personalization as well. You both still do, no matter what life throws your way! 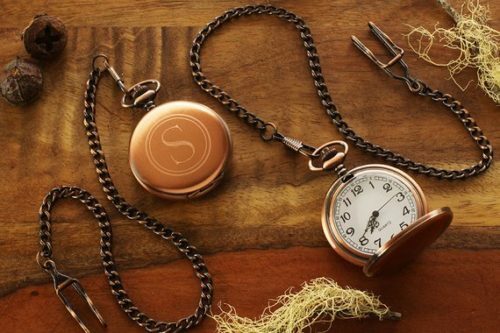 This engraved copper pocket watch will be something that he cherishes for the rest of his life, and maybe even passes down to the children. 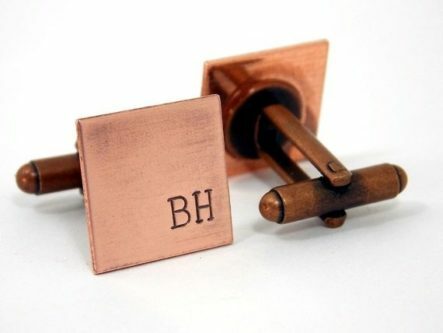 These no-nonsense square shaped copper cufflinks be monogrammed with his initials, up to three of them, to celebrate your 22nd copper modern anniversary. 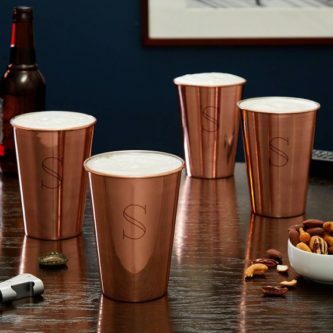 With this set of four personalized copper pint glasses, he has enough for the both of you and a couple of his pals. 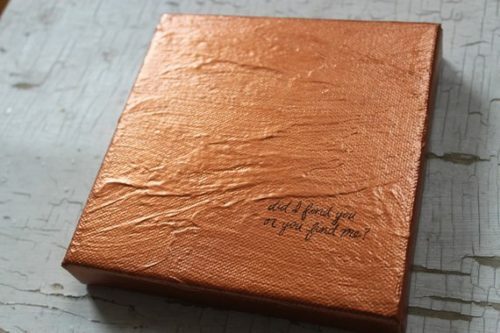 Personalize the copper wallet card with something you would like to tell him for your 22nd anniversary, or a quote or part of song lyrics that you two love. That way he can carry it with him wherever he takes his wallet. 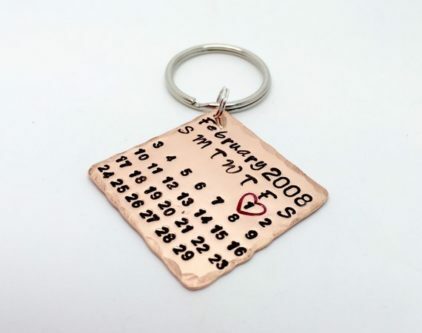 The date you got married will be forever engraved on the personalized copper calendar keychain that he carries his keys on everyday. 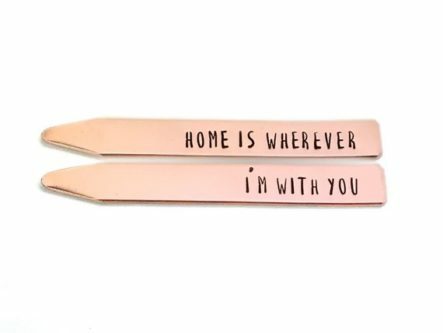 Home is wherever you are together! 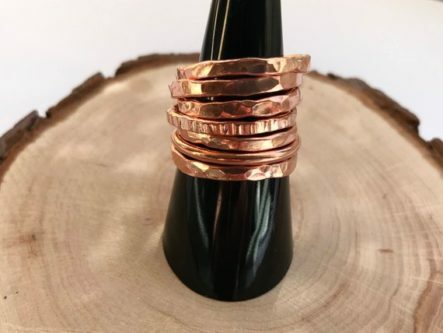 This simple copper band ring is great for replacing the wedding ring, or adding a ring to accompany it on his finger. 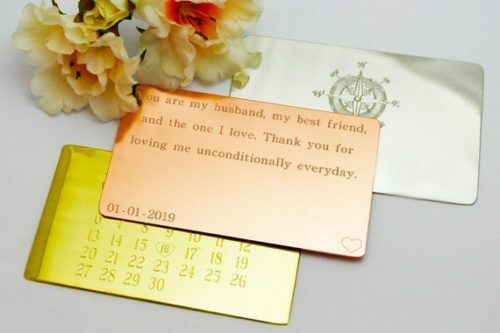 The copper plaque may look too bland, except for the fact that it can be personalized with a quote or the date you got married, or even your names. 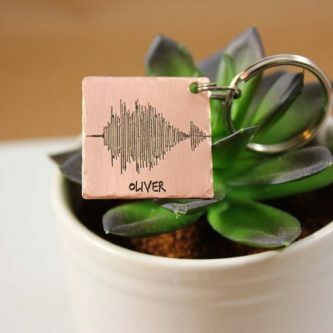 Record the sound of your voice saying happy anniversary to him and have it engraved on this copper soundwave keychain. He can take your voice with him wherever he goes after that. Masculine with the washer on it, and touching since you can personalize it. 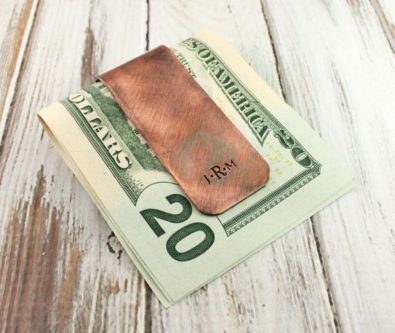 If he is someone who doesn’t like carrying his money in a wallet all the time, he definitely needs a customized copper money clip to keep everything in one place. 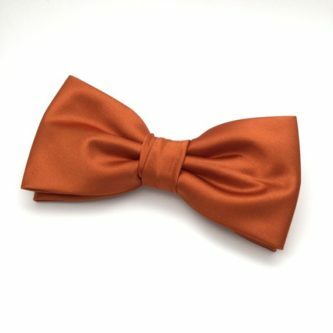 This dark copper bow tie will go with almost anything! 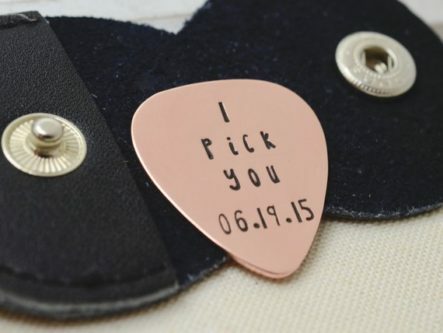 He picks you and you pick him. Now he can play his guitar with that message from here on out. 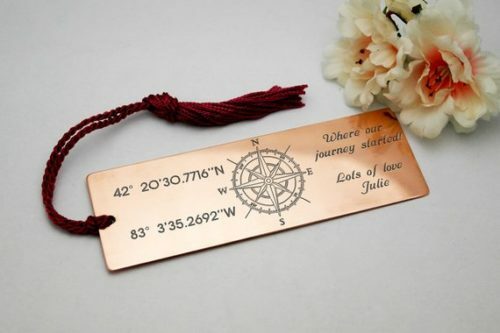 For the husband who is a bookworm, personalize a copper bookmark with the coordinates of your wedding. 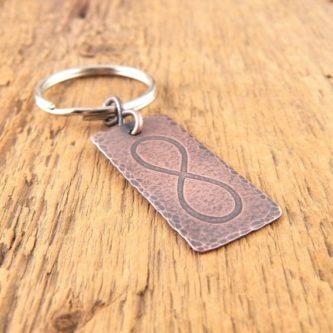 You two will be together forever, and he can never forget it with the keychain being his constant reminder. 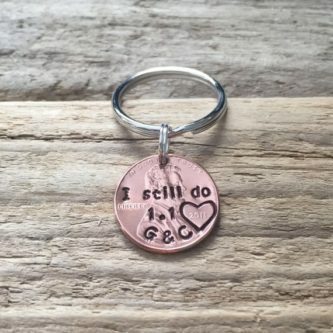 This circular copper wallet insert is smaller than the wallet card, but you can personalize it with both of your initials and the date you got married. It will hold a special place in his wallet and his heart. 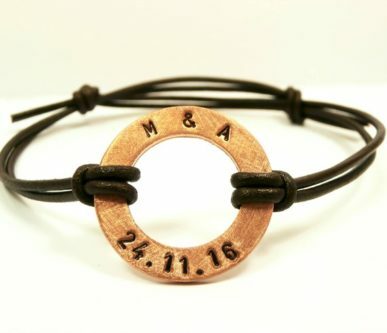 Copper is a great metal to represent your 22nd modern anniversary, and no matter what gift you choose for your husband, he will love it!